A huge part of the college experience is joining and being active members of societies. First year journalism student Eoin Lúc Ó Ceallaigh has done exactly that. The 19-year-old from Carlow was recently named Best Fresher at the BICS awards, where he got national recognition for his participation and dedication to societal life. 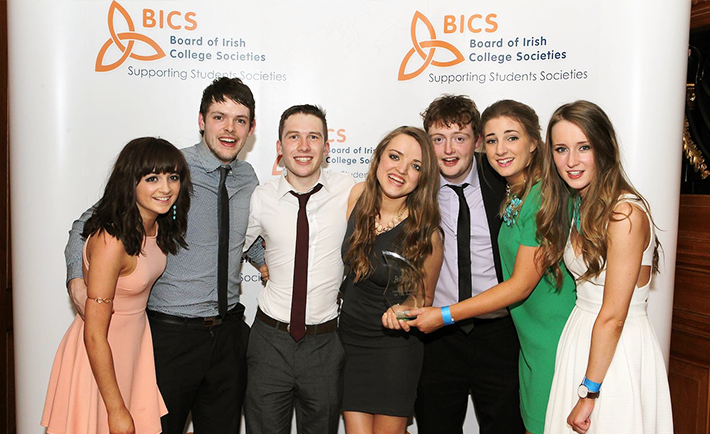 Eoin Lúc also won Most Promising Fresher at the DCU society awards on March 27. “I didn’t even know there were awards until I was told that RAG were nominating me for it,” he told The College View. When coming to DCU, Eoin Lúc joined a “ridiculous amount of societies” but is especially involved in RAG and MPS. “I was elected onto the events team of RAG at the start of the year and I’ve been involved in organising events all year,” says Eoin Lúc. He also took on the roles of the first year rep when the original one had to take a step back. Eoin Lúc’s highlight of his first year in DCU was setting up Rag Rhythms, his own social project in Ballymun. He organises a group to go to the Aisling Project in Ballymun every Tuesday to teach music to children. Getting to know the kids and watching them improve each week has been very rewarding for Eoin Lúc. The group recorded the kids’ music recently which they are going to use to make a CD for each of them to take home. “It took a lot of organising and planning but it was very worthwhile and I’d recommend to everybody to get involved in the RAG social projects, as it’s one of the most worthwhile things you’ll do in DCU,” he told The College View. Another of his highlights was helping to organise the RAG Rumble, which was the society’s biggest event of the year, which took place in the Venue in December. Eoin Lúc joined MPS with the intention of focusing on DCUfm but also became a part of DCUtv “more by accident than anything else”. He has since learned how to film and edit videos, which has been a huge help to his course. Eoin Lúc doubts he’ll join any new societies next year but plans on staying very involved with his current ones.